Lincoln and New York — Moey Inc. The political success of Abraham Lincoln was owed in many ways to his impact on New York - then the countryâs largest and wealthiest state. This exhibit traced Lincoln's relationship with the Empire State. For four days and nights in 1863, New York City's streets were a nightmarish scene: working-class men, in full mob-mentality, were terrorizing the black citizenry and police forces in protest over the new Civil War draft. To help bring the intensity of these terrible events to life, we designed and installed a 15-foot cylindrical environment that immersed visitors in the sights, sounds, and personal recollections of the event. We sourced the experiential content from newspaper articles, police blotters, and personal accounts and produced the program's text, visuals, and audio. 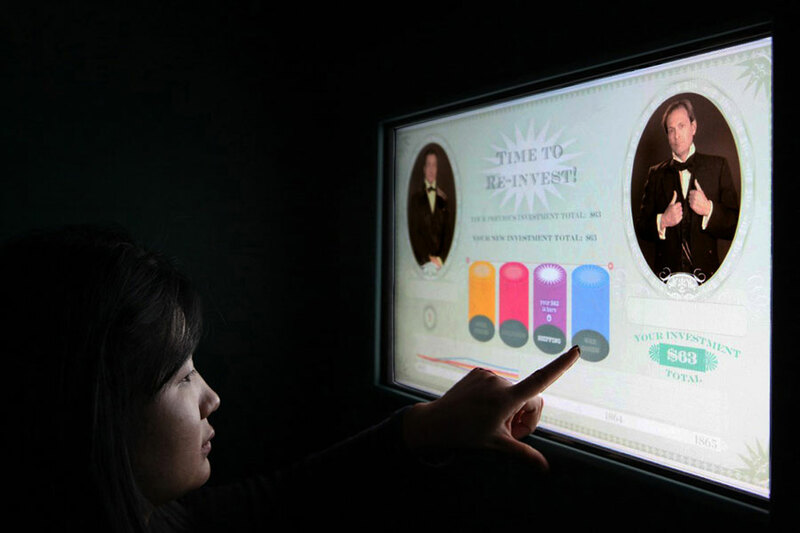 We programmed this interactive game that showed visitors how the Civil War helped develop New York's economy. Participants were given a chance to invest $100 in gold, railroads, military uniforms, or shipping, and then asked to make a series of business decisions to seal the fate of their fortunes.